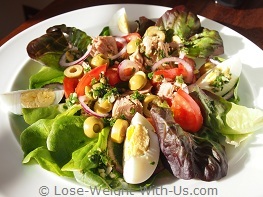 The tuna nicoise salad recipe is a simple classic summer salad. This nicoise salad has such a great tasting combination of salad ingredients. This is a quick and easy recipe ready in 15 min, as we are using canned tuna and only the eggs need cooking. This salad is also good for a packed lunch, so you can take it with you where ever you go, just add the dressing before eating. There are 254 calories and 6g of net carbs per serving. Recipe Nutritional Profile: Diabetes Appropriate, Healthy Weight, High Protein, Low Calories, Low Carbs, Low GI, Gluten Free, Good Source of Vitamin A, Vitamin B-12, Vitamin B-6, Vitamin C, Niacin, Phosphorus, Riboflavin and Selenium. First of all, we need to cook the eggs: place the eggs in a small saucepan cover them by at least 1/2" (1cm) of cold water and bring to the boil over a high heat. You can add 1/2 tsp of salt to the water it will help to stop the egg shell from cracking and will make the eggs easier to peel. As soon as water starts to boil reduce the heat to simmering point and let them cook for 6 min if you like the soft bit in the middle and 7 min for a fully cooked through egg. Cool the eggs down rapidly under cold running water and let the eggs sit for 2-3 min in the water before peeling them and cutting them into 4 pieces. For the salad dressing: in a shallow cup mix all the dressing ingredients together such as olive oil, garlic, lemon juice and capers. Lay the lettuce leave onto a plate and add the tuna, tomato, onion, olives, and eggs. Drizzle over the dressing, then finish the salad by adding fresh parsley and ground pepper. Bon appetit!